First and foremost, I have to thank Katie for leaving me an amazing comment on my blog. If even half of what she says is true, then I know that all the time and effort I put into comedy is well worth it. Comments like that make me feel so fortunate to even be able to perform in front of people, so thank you, Katie, and everyone else who has shown their support. Now that I’ve slept and had some time to think about the entire weekend, I suppose it’s time to reflect on the two shows this past weekend. I already reviewed the Fred Leeds show, but I still think it’s important to talk about the show’s significance. I only knew Fred Leeds for a short period of time (I had the honor of performing with him in my first show as a Smarty Pants member), but I knew him long enough to know that he was an amazing man. Before I met Fred, I was actually afraid of getting older. I felt like I had to accomplish everything I really wanted to do before I hit 50, otherwise it would never get done. But the fact that Fred was still performing at the age of 70, and the energy and charisma that he had, assured me that life isn’t over as you get older. So here’s to Fred, an amazing improviser, and even better person. I hope that we did him proud at his First Annual Comedy Rocks show, I know he was watching the whole thing. What’s amazing about this past weekend is that I had the opportunity to perform in not one, but two incredible shows. Saturday’s Send-Off Show was one that I will remember forever. The show started with the video that Moran, Nate and I spent a good deal of time on; it depicted a day of reflection for us as we prepared for our final performance with The 8th Floor. After the video ended (suitably on Jay-Z’s December 4th’s ending lyrics “If you can’t respect that, you’re whole perspective is whack, maybe you’ll love me when I fade to black”), I started the show off recapping the history of The 8th Floor. I thought it was important to share with the audience what all The 8th Floor has gone through and accomplished in the past 3 years. With all of the sentimental stuff out of the way, we started the improv off with “First Line, Last Line.” Every now and then, as an improviser, you have a scene where it seems like every line out of the player’s mouths gets a laugh. “First Line, Last Line” was one such scene for us. The rest of the first half of the show went well, though it lasted longer than we had planned. “Home Shopping Network” was of course filled with loads of energy, with Nate and I nearly sweeping Moran and Lindsey (after they had talked so much trash…) We had planned for a 90 minute show, but by the time we reached intermission, it had already been over an hour. For those of you who don’t know, “Most Dangerous” is a game where the players play barefooted and blind folded, with around 100 live mousetraps set up on stage. It was then time for the last game. “Swinging Pendulum of Death.” When we thought about how to close, “Pendulum” seemed like the natural end, for the game ends with all three characters dead. When Kyle called the game over, I was officially done performing with The 8th Floor. And then it happened. I don’t know if it was because our show was so good (I thought it was great), or because of what we were able to help start (it’s been a long, but amazing 3 years), or what, but Moran, Nate and I (and the 8th Floor) received a standing ovation (our first). I was speechless, and still am when I think about it. But just like Katie’s comments, that reaction from the crowd reaffirmed everything we had put into the group. All of the late nights, long practices, miles driven, expenses paid, (and on and on) was validated and worth it. So again, I can’t say it enough. Thank you everyone for your support, both this past weekend, and in the three years that The 8th Floor and myself have been performing. And I suppose that means it’s now time to move on and focus on the future. Luckily I am already able to perform with another hilarious group, and already have a full weekend of performances and events this weekend. 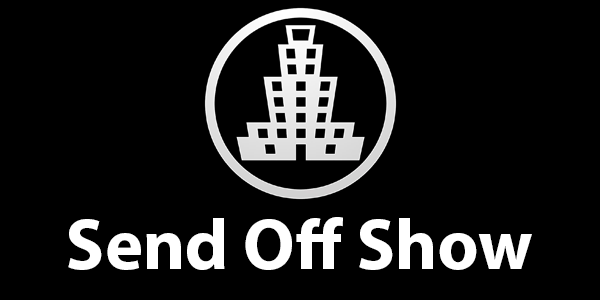 As a side note, I will be making DVDs of the Send-Off Show here in the (hopefully near) future. If you’d like a copy, let me know and I’ll get one to you. Thanks again, to family, friends, strangers, and of course The 8th Floor. I was talking to Matt at Smarty Pants practice tonight and something he mentioned got me thinking about my blog and the stand up that I do. He talked about how, in a way, it can be nice to be a relatively unknown comedian. As an unknown, you can do the same material over and over again and people will still find it new. It’s definitely an interesting concept. Though there are certain jokes that you want your favorite comedians to tell, for the most part you like hearing new material each time you go see them. If you saw the exact same show again and again, would you continue to put forth the effort to go see them? To make things worse, most people don’t realize that headlining comedians do (for the most part) the exact same set every single night, at every club they go to, for an entire year (or more). Have you ever been to see the same comedian twice in one weekend? Minus some crowd interaction and sometimes the order of material, you’ll often get the same jokes with the same set ups and the same punchlines. BUT, this is what works for stand up comedians. They have a new audience every night, why not use material that you know will work, that you have spent countless hours perfecting at local open mics? And now we get to my dilemma. By posting the videos of the stand up I do, am I effectively limiting my audience that is eager to see me? Will I disappoint the people that come to my show if I do 100% of the set they saw on YouTube (or 90% or even 50%)? Obviously many people realize that seeing comedy in person is 100 times better than on video, but does that make it worth it if the person could just wait a few hours (or however long it takes me) after the event to the see the video on the Internet? If I think about this in terms of a business (which is what stand-up is, a sole-proprietorship where the product you are selling is you), then posting to YouTube and detailing my set out in my blog are potentially cannibalizing my own product. And all of that sounds bad. But the trade off is that I can reach a much larger audience by posting my videos. They can see, with little risk involved, if they think I’m funny. That could encourage them to come out and see me live next time I perform, as they have already had a test-trial and realized they liked the product. Of course, will they still be satisfied if the next time they see me live, it’s the same material that I did on YouTube… and the cycle begins anew. I guess I don’t really have an answer, I don’t know which is effectively better. Until I figure that out, I’ll keep on keeping on, posting comedy videos every now and then to share what I’ve been working on. A stand-up set from 2006 at Funny Bone at Newport on the Levee. My 19th stand-up show. UPDATE 2016: It’s weird to leave this up considering how bad it is, but I think it’s an important part of my evolution. Plus who doesn’t enjoy a good anti-Michigan joke? As anyone that has read some of my previous postings can tell, I have a problem with commitment. I’ve attempted to start blogging consistently on a number of occasions (see “Joke of the Day”, “A New Thinking”, “The Cooking Project”, and “What I Learned”), but I’ve been unable to stick to any of them. Well, with 2007 here, it’s time I try one more time. Now I know what you’re thinking, you’ve tried it four times with your myspace blog (and a number of other times w/ AIM, etc), what makes you think you can do it now? 1) I have this feeling that 2007 is going to be huge comedic year for me, Smarty Pants, and The 8th Floor, and I want to do everything I can to make sure that’s true. The challenge is to myself, and it is to write about something (anything) every single day of 2007. In order to motivate myself to do this, I will be offering $10 to the first person that comments on my wall whenever I fail to post a new entry. That’s right, you read correctly. I will give $10 to whoever calls me out first whenever I miss a day of blogging. And ok, I understand that $10 isn’t all that much money, but it can get you two combo meals at Chick-Fil-A. Plus, the key here is whenever I fail to make a new post, meaning that for every day that I miss posting something in 2007 (and someone calls me on it), I will pay out $10. So theoretically I could pay out $3,640 if this is the last day that I make a post (not talking chump change any more). The first person to comment on my myspace wall pointing out that I did not post a new entry will win the $10 for that day. If you don’t have a myspace account, then shoot me an email over at drewtarvin [at] gmail [dot] com. If you live near me, or I will see you in the near future, I will give you the money in cash. If you live in a different city, then I will mail you a check for the amount. If no one manages to post a comment before I make up for the missing post, then I’ll be the winner. If I no longer have a passion for writing (very unlikely), then the challenge could end indefinately. (Any missing entries prior to the announcement of discontinuation WILL be paid). Once I create my own website, the blogs will be posted there as opposed to myspace. If I end up paying out a large number of payments, I may switch to PayPal for my long-distance readers. An entry can consist of any number of types of post. They can be as simple as a one-liner, more in depth like a story or an entire bit, or unrelated to stand-up in the sense of: something I’ve recently learned, a review of a movie (or cd, tv show, food), a tip for using stand-up or improv in every day life, etc. An entry as simple as “Here’s my post for the day” does NOT count, I won’t use that as a loop hole. Posting an entry day does not necessarily mean on every single *date*. There will be times when I post something after the stroke of midnight that is geared for the day before (unfortunately our lives don’t all revolve around the 24-hour clock of 12:00am, especially on days I will be traveling). Therefore an entry is to be assumed missing after 5:00am. Finally, there are certain circumstances where I may not be able to post an entry right away (such as travel out-of-town or extreme sickness). In these cases I will post a note IN ADVANCED so you are all aware. I will also make up for those posts so as to still reach the 365 number. So that’s it. 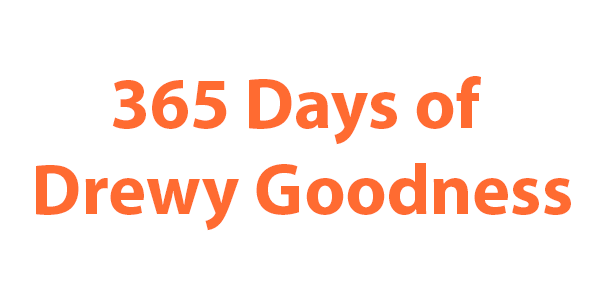 That’s the 365 Days of Drewy Goodness Challenge. Leave a comment. This is by far the biggest help. Leaving a comment helps me gauge people’s reactions. Whether it’s a note about a joke that I’ve left, or even a question, your comments can lead to further discussion (and sometimes better bits). Tell your friends. The more people that read my blog and know about my upcoming events will become more sources for feedback so I can get better. Feel free to suggest changes to the challenge or other things I can do to get better. Here’s to a great 2007.